Gayathri Pai's Food Bytes: Hanuman and Veena of Narada Muni. ** I had come across many versions of this story in net, however, I found this to be much more meaningful than the others. I have translated it to the best of my ability. 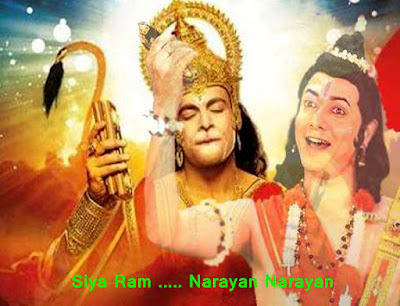 In this story it shows that though Little Hanuman was bestowed with blessings from Goddess Saraswati herself as to being the Best of Musician, Hanuman still went about seeking Narada Muni’s Blessings as he considered Narada Muni to be the most expert in Music, who always went about praising and singing Lord Narayan’s miracles. Also he wanted to put forth the importance of Guru in a persons life. It is said that Guru's presence and Guru's Blessings is very important in every human being's life. It is believed that without the presence of faith towards one's Guru even God does not accept that human being into him. The way to God has to be always followed through footstep of Guru. ** When Narada Muni as per his nature was touring round the three world’s singing Hari bajans and playing Veena his musical instrument, Hanuman who was still a child was intrigued and asked his mother Ketari about the person. She told him he was a great soul and Hari Bhakt (Vishnu-priya). 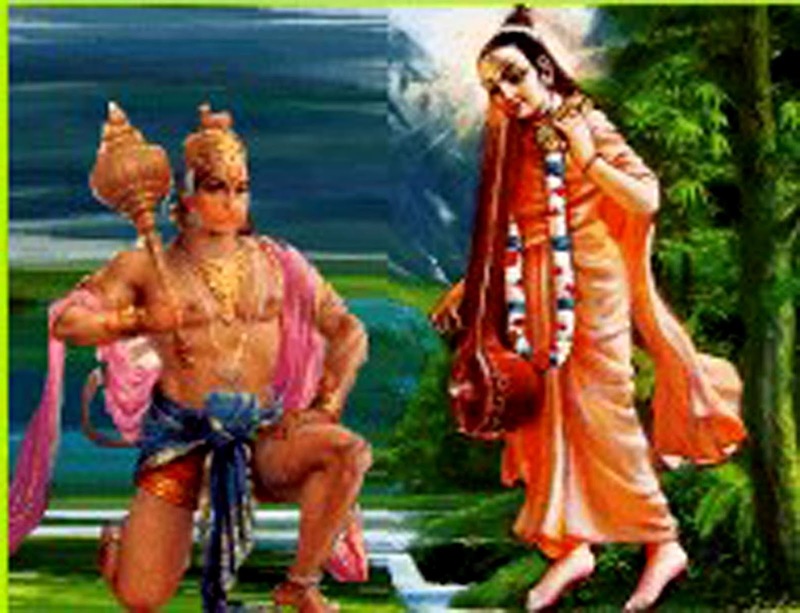 She advised little Hanuman to seek his blessings. 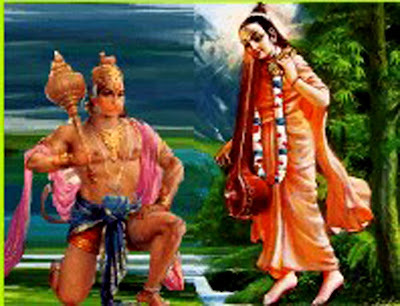 Hanuman stood on Narada Muni’s path and humbly offered his Pranams. He seeked blessings from the Muni without which he made it very clear to the Muni that he would not be allowed to proceed further on his journey. ** Narada Muni a well versed jnani was fully aware of little Hanuman's activities and all the blessings that were bestowed upon the child from each and every God / Goddesses. So he bestowed him the blessing of being an excellent musician which pleased the kid Hanuman very much. But he was still reluctant to allow Narada Muni to continue on his journey till he was satisfied that he had indeed got that benediction. So he still stood on Narada Muni's way and did not allow him to proceed on his journey. ** In order to please the kid Hanuman, Narada Muni obliged to sit on the ground, while he placed his Veena on the rock beside him. 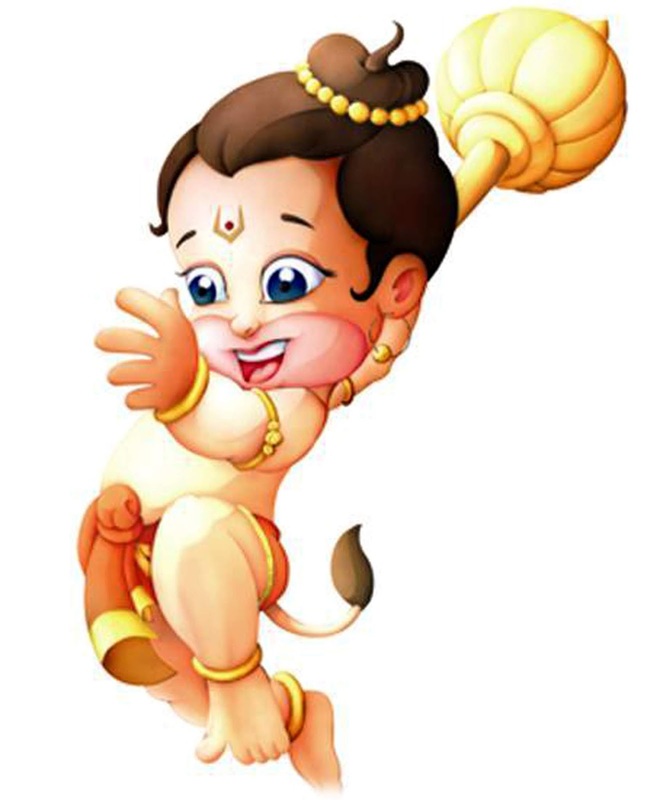 Little Hanuman began to sing with the sweetest of voice in Malahari raga a tune that could melt a rock. Narada Muni closed his eyes enjoying the music unaware that the rock on which the Veena was placed had melted. Later he played the Bilahari Raga, a tune that started to make the stone take its original form. Narada Muni who was in Bliss listening to the singing of Hanuman, was not aware of the state of his Veena. ** Narada Muni admitted to Hanuman that he was the best musician, opened his eyes and got up to move ahead in his journey. He reached out for the Veena and to his dismay the Veena was stuck into the rock, as when Hanuman singing in Malahari raga had made the rocke to melt and when Bilahari raga was sung the rock had regained its shape. In the process the Veena / tambori got stuck inside the rock. Narada Muni, just could not retrieve his veena from the rock how much ever force he used, and the Munivar also knew that he could not proceed on his journey without his constant company of Veena. 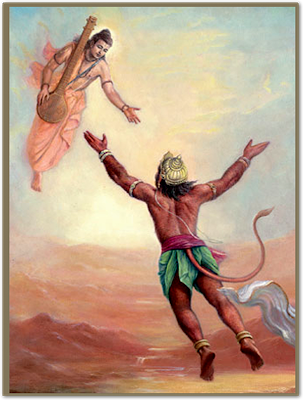 ** Narada Muni asked Hanuman to sing the same tune again so that when the rock melts he could retrieve his Veena. 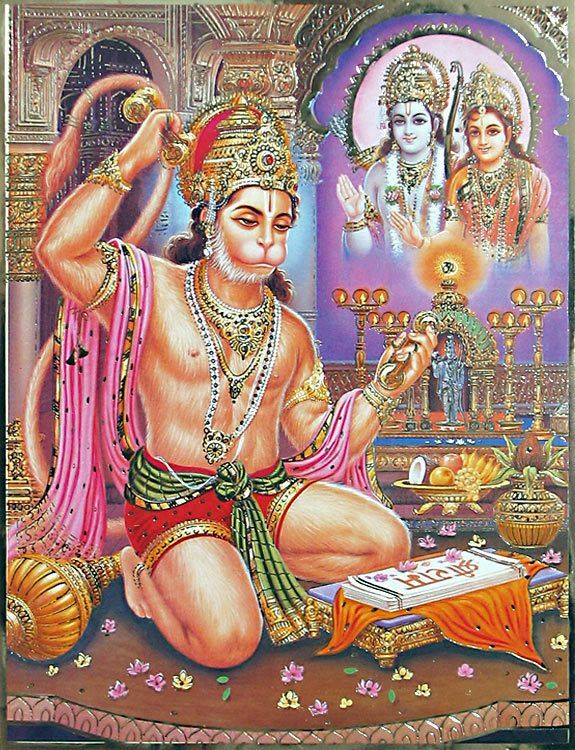 Hanuman refused and ran into the Palace and all round the kingdom here and there just like what a monkey would do. This made Narada Muni also run behind him as he had to have is precious Veena back. Hanuman’s Mother came to know about this and stopped Hanuman and asked him to justify the bad behavior. To which Little Hanuman replied that he wanted the holy lotus feet of the great sage and Guru Narada Muni to touch each and every room in the palace and the kingdom, by which their home and kingdom would now be a holy place of pilgrimage. ** Narada Muni was very pleased with Little Hanuman's Humble ways and he replied to him that he was indeed blessed, as he was to be Lord Rama’s eternal servant. 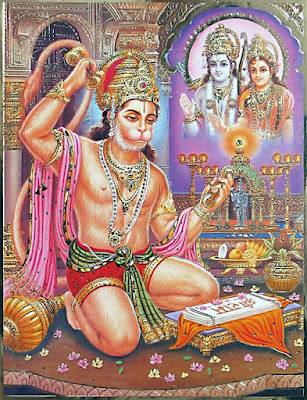 Hanuman by now was satisfied and obliged to sing the Malahari raga / tune again so that the rock would melt and Narada Muni could get back his Veena. Thus Narada Muni retrieved his Veena and continue his journey after showering blessings on Hanuman. Hanuman too always continued to sing songs praising lord Rama who lived in his heart. ** Moral of this little episode as per my thoughts : This is a little story that shows Guru Bhakti is the most precious of all. Holy person’s or Guru’s are never envious. They are happy to see their disciples or followers become successful. They always bless people / samaj to accomplish greater heights. Just as Little Hanuman was blessed to be even better musician by Narada Muni who himself was the best proclaimed musician. Without A Guru’s blessing, a person cannot attain God. As Guru is the person / that latch that links you to God by showing you the right path. Always give due respect to your Guru. ** Disclaimer : I have adapted and written this to the best of my knowledge from net, friends and various other sources. I read through a lot of matter on this particular incidence of Hanuman and Narada Muni, condensed and wrote this small article on my own way to the best of my ability. I have also included Google pictures and the picture credits goes to them. If I have hurt anybody’s sentiments in the process, It is not intentional and in no way meant to offend anybody or any religion. Plz. do excuse me for the same.